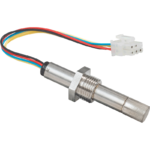 Watch this video to see a short demonstration and how-to calibrate one of SST's Zirconia Oxygen sensors. Hi, today we are going to demonstrate how to calibrate Zirconium Dioxide Oxygen Sensors. And one of the interface boards and show you how simple it is to calibrate. 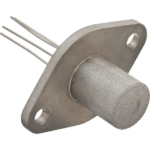 So, this is the sensor here. 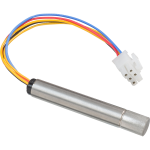 It is one of our probe mounted, screw fit probes. Which is designed to go, typically, into the flue of a gas or bio-gas boiler. And, its connected to this OXY-LC interface board. This board is the V25 version, that means the voltage output, which is 0 to 10 Volts, and that represents 0 to 25% oxygen. The linear relationship. One of the beauties of these sensors is that they don’t require a reference gas. 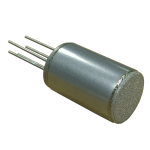 Many other sensors do require a reference gas and that means you have to worry about getting some kind of known gas concentration to one side of the sensor. That’s not the case with our sensors. Once they have been calibrated, they don’t need any kind of reference gas. So, we’ve got it all connected. You can see we have got the 5 wires from the sensor going to this side of the PCB. And on the other side we have got the power. A 24V DC supply going to the board from this power supply here. There is also a couple more connection to the board. We’ve got this green wire which is measuring the voltage output, which is 0 to 10 Volts. And this is going to the Digital Volt Meter on the top. It is currently reading around 8.5 – 8.6V, which is high. The air in this room is around 20.7% because fresh air, if its dry, is 20.95% oxygen. Because there is some humidity in the atmosphere, it is always going to be slightly lower. Typically, it is 20.7%. So, 20.7% of the full scale of 25, multiply it by 10V gives us around 8.3V. So it should be reading around 8.3V. But it has not been calibrated yet and it is not surprising it is not measuring the right value because the sensor has come straight from production. Every sensor is a little different so we have to calibrate it in a known environment to make sure it’s accurate. Now the great thing is we could just calibrate in fresh air, it is a nice, simple, free gas. In order to calibrate, all we have to do is short-circuit the cal input of the board, which is this one here on the end. We just have to short-circuit that to 0V for a second or more. In the real world, you would do that with a switch or of it was automatic it might just be as the digital output from a PLC would just go low for more than a second and that would tell this board to calibrate. We are going to do that now. I’m simply going to short-circuit this pin to the 0V line of the power supply for more than a second. You can see now the output is dropping to something a lot closer to 8.3V. So that is the sensor calibrated. That’s it calibrated across the full range, right down to 0. These sensors don’t need two-point calibration. They don’t need a 0 to an offset calibration. They just need a span calibration and you can do that in any known gas you like. But the simplest way to do it, is in fresh air. Just to prove that the sensor actually measures oxygen, it is sitting up here at almost 8.3V which is pretty good. And I am just going to blow on it. And you can see the output of the sensors dropping. Just remember to be very careful as the sensors are extremely hot, they are heated to 700 Celsius inside, and the surface of this porous cap here, which is designed to protect the sensor but let gas through, is around 250 Celsius. So you certainly do not want to touch it. You can see that the oxygen reading went down and now it is crawling back up to around 8.3V. So that’s the demonstration of How to Calibrate a Zirconia Oxygen Sensor: It is extremely linear, very reliable and as you have seen, very simple to calibrate.